Regal is a proven leader in helping people with credit problems and providing dependable transportation. A reputable dealer with over 25 years in the used car business. 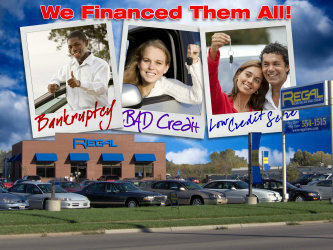 Regal provides Financing regardless of your credit situation. Our basic requirements are: a Driver's License, Proof of Residence and Proof of Income. We would like to invite you to stop by our Wichita location where you can Experience the Regal Difference for yourself. Our friendly staff will treat you with respect and help you choose the vehicle you want.